Mountrail County is a county located in the state of North Dakota. Based on the 2010 census, the population was 7,673. Its county seat is Stanley. The county was originally created in 1873, then removed in 1892 and re-created and organized in 1909. Named for Joseph Mountraille, a Metis voyageur of some prominence. Created as Mountraille County by the 1872-73 Dakota Territorial legislature and named for Joseph Mountraille, a Metis voyageur of some prominence, but the boundaries were different from what they are today, extending from the Missouri River north to the border with Canada. 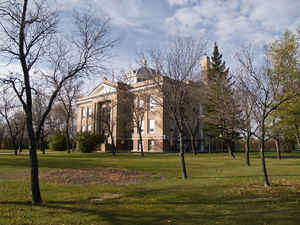 It remained a county when North Dakota became a state in 1889, but in 1892 North Dakota Legislature authorized neighboring Ward County to take over all of Mountrail's territory, and the county was eliminated. Its re-establishment as Mountrail County resulted from an effort to partition Ward County during the November 1908 general election which resulted in the county's existence being officially proclaimed on January 25, 1909. Government organized: January 29, 1909. County Seat: Stanley, 1909-present. As reported by the Census Bureau, the county has a total area of 1,942 square miles (5,030 km2), of which 1,825 square miles (4,730 km2) is land and 116 square miles (300 km2) (6.0%) is water. Mountrail County is one of several western North Dakota counties with significant exposure to the Bakken Formation in the Williston Basin.